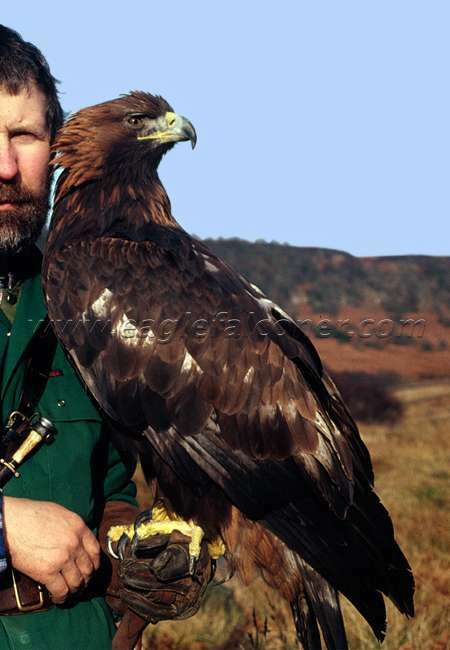 First Published in the Austringer 1989 Journal of the Welsh Hawking Club, and then in the Falconers Magazine issue 48. 'They call the wind Maria. 'It was those few bars of the song from a sixties hit musical that were repeatedly going through my mind as I hung on to a rope high in the Scottish mountains. At the other end of the rope was that mountain goat and friend Terry Pickford, who, without his help and skilful knowledge of the area and the people, I would not be dangling from this rope, with that incessant tune going through my head. At least it helped to keep my mind off what lay below, not a lot, for an awful long way. I was at that point where it was just as frightening to go on up, as it was to back on down, in a word I was stuck. Terry had crossed this tricky bit as though it was not there. 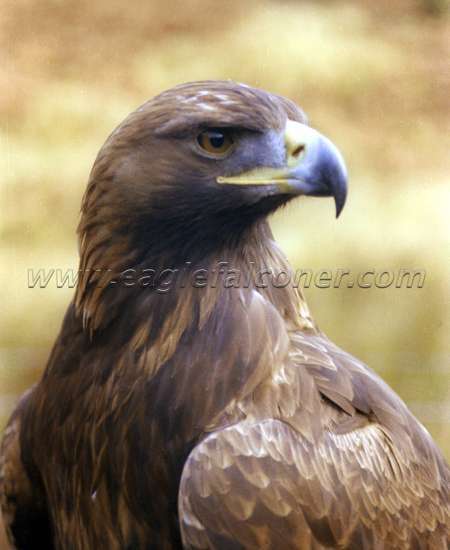 After a few moments which seemed like an age, I was able to collect my thoughts, I remembered that folded piece of paper in my breast pocket which was one of the very first Scottish Home Office licences granted, to take from the wild, a golden eagle eaglet. And so temptingly close within a few yards, were the first sticks of the base of an eyrie. 'Come on! Clear your mind and step across that gap." I told myself. "If you slip the rope will stop you.' Somehow I did not believe that, but suddenly the adrenalin surged back and the next moment I was face to face with two wonderful eaglets. No doubt a male and female as the difference in size was quite noticeable, the male was very friendly and I fell for him within minutes, the female was more wary of this strange visitor to the nest, her beak was half open and she reared her head back at the approach of my hand. 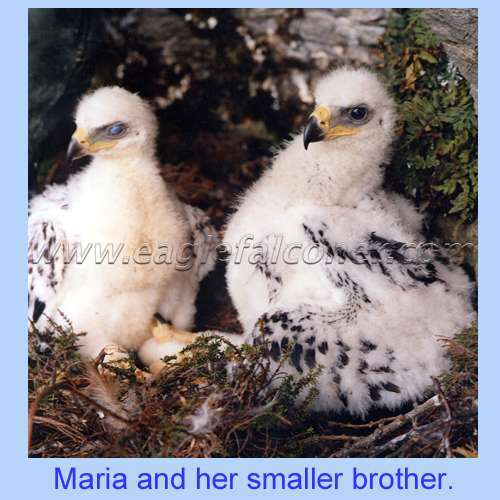 They were a little younger than I had hoped, but we had tramped the highlands for a couple of weeks now, and although we had found a number of eyries, some empty, some containing eaglets, we had decided that this was the most suitable site. To leave it any longer would mean yet another journey north to the highlands and with five trips under my belt that year I was running out of holidays and excuses for time off work, Anyway I did not relish the idea of struggling with much larger eaglets on this narrow ledge. No matter how engaging this little male eaglet was, it was the female I had come for, I lifted her eight and a quarter 8 pounds into the cane basket, secured the lid and lowered her down. My journey back down was much faster than my ascent. Just a slight hesitation over that gap, I backed the way I had come. And now, as I look up into the blue sky above me, there hanging on huge broad wings looking straight down at me is 'Maria.' It hardly seems like fifteen years ago since I plucked her from the eyrie and the company of her brother, I wonder how he made out in the big wide world. Maria and I have hunted these remote and beautiful hills for many years now. I know the tracks, the loose rocks and the marshy ground, and she knows the strong winds, the updrafts, the quiet perches and the vantage points. And yet every time we are here we find new things to see and explore. We work as a team but not necessarily always close together, w âe start early in the morning, after driving many miles over rough bumpy tracks. I leave the vehicle just off the track which is cut along the side of our remote valley. Here we are perched about one hundred or so feet above the valley floor. Even at this low height I can get some idea of the strength of the wind, a glance to the sky line above the hills at the far side of the valley gives me a better idea when I see the speed of the scuddy clouds. A moment or two to scan the area just to check that we are totally alone. Now she stands on my arm, as I lift her up her concentration is on the distant hills, she rouses her feathers, shakes them all back into place and then the feeling of wind in her face launches her into her true element. On broad strong wings she lifts on the wind, from where I'm standing I can just see her flying along the opposite hillside, her golden plumage blending so well with the bracken covered hill. She lands, and I mark the place in my mind and then set out to make my way across, negotiating fences and marshy ground. Now at the base of the hill as I look up it seems to climb into the heavens, the gradient is so steep as I dig my toes into the soft peaty soil, I make my way slowly but surely up to where Maria waits peacefully in the bracken. As I come level with her she greets me with a few soft tones, I stand next to her for a few moments leaning on my short trusty thumb stick to regain my breath. Then as though she decided I have rested enough she opens up her wings and glides out from the hill to climb .further on up. Together we ascend the hill, Maria so gracefully, whilst I struggle up through that infernal bracken. I somehow always seem to reach the summit first, although within seconds of catching my breath from the climb, she sails past about fifty feet above me and out over the valley. The low winter sun is warming once I round the corner and for a few minutes I am sheltered from the wind, the valley bottom is still crisp and white from the night frost,it will be a couple of hours before the sun will reach down there. This valley runs for miles, but we concentrate on about four miles of steep hill and sheer cliff. From where I am the vehicle looks like a dinky toy, we must be about four hundred feet above the valley floor. At this stage it is Maria who decides which way we go along this high moor ridge, she has gone on ahead up the valley for about half a mile, I follow on along sheep paths, the ground is very steep and these paths offer the only sensible routes. Within minutes she is right above, turning on the wind to repeat the ground she has just covered, backwards and forwards, sixty or seventy feet up scanning the ground below, then she will glide past and check the ground half a mile or so behind me. Every fifty or so yards I stop to watch this mastery of flight, I have flown eagles for the past twenty years over flat arable firm land, sloping fields of the wolds,'sand dunes, sea cliff headlands and small islands. 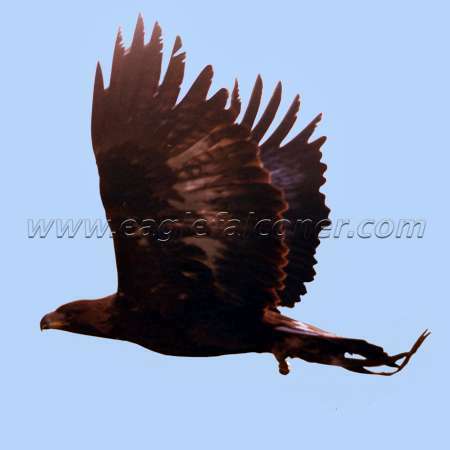 There is nowhere better for an eagle to show its skills than in the high hills with a strong wind blowing. As I gazed up, as though it was the first eagle I had seen, a black arrow drops through the sky straight for her, at the last moment she tilts to one side and the arrow misses her. At the blink of an eye it comes back from below, but then lets out the 'hek-hek-hek' call of our little tiercel peregrine, so intent on seeing off this intruder he has past within fifteen feet of me. As if by magic there are now two diving at her, the Ã falcon has joined her mate. Maria seems unconcerned, but I can see from where I am her head tilting upwards as she keeps a watchful eye on them, As this joint attack gets too hot for her, or, she just gets bored with them she tries and often succeeds in out flying them, by what has been so aptly described by Mike Tomkies the wildlife and eagle expert, as jet-gliding. With half closed wings and tail tilted to the wind she jet-glides across the wind, as she passes me I hear the air screaming through the slit in her single leg bell. What speed does she reach?, I have no idea, whatever the speed it is exhilarating to watch. The peregrines follow for a little while but, could not, or were not interested in sustaining the speed and so flew across the valley and into the blue distance. Maria kept going for about a mile and then rose high in the sky, right into the morning sun. She was now invisible to me. 'Beware of the Hun in the sun." I thought, and carried on my way along the hill. In places the hill has quite a bit of cover, I was approaching a strip of hazel thicket, which is about twenty yards wide and reaches the valley floor, further on there are many thorn trees. There are badger setts amongst oak trees and out in the open hill, I have kept an eye on these since last season when Maria found a fine young brock lying dead outside one of the setts, he had teeth marks around the neck and head and there were signs of human interference as some of the sett holes were stoned up. Suddenly a shadow past over me, Maria was back, her head looking down at me, I waved to her, she circled two or three times then moved on along the hill to land in the golden bracken near the top of the hill. Her colours blend so well into the hill that one can soon loose her location, I climbed to the top and made my way along the high moor edge. The grouse were marking out their territories, their gruff calls toeing and froing across the moor, occasionally one would fly out and along the line of the hill, but Maria never took any notice of them, she was more interested in in the ground game of rabbits, hare and fox. As I approached where I thought she had landed I had to pick my steps very carefully as the ground sloped very steeply. I was quietly calling her name expecting her to talk back to me. Nothing, I thought she must have slipped back into the air whilst I was looking elsewhere. Then further down the hill, below some large bill oak trees I heard something crash through the undergrowth. Almost at the same time as this sound hit my ears, Maria launched out from the bill above me, I had passed within a few dozen yards of her. Straight out she went across the valley, then as she came above the oak trees she made a superb dive, there was a crashing of branches as she clipped the outer edge of the trees, then from out of the cover of the trees shot at full speed a roe buck. Maria had given him a glancing blow and he was not hanging around. I was amazed, as she had not seen a deer before and to fly with such determination, but she was not finished with him yet, as out of the trees she came flying low and fast. From where I stood high above the edge of this huge natural amphitheatre, crafted by natures wonder makers, the glaciers of the last ice age, I was impressed by the speed with which she had gained on the buck and within seconds she had grabbed him by the rear and rode bronco style around in circles. I found myself cheering on the buck as he kicked himself free. I loped down the hillside at breakneck speed, and was gasping for breath as I approached Maria who was sat on the ground. I gently sat next to her and congratulated her on a magnificent effort, she was in a peaceful mood, her beak slightly open as she panted quietly. I offered her my arm for her to step on to and after a rest we went on our way. It was not for some time, in fact, the following season that Maria came into contact with deer again. The morning dawned with an almost clear blue sky, and by the time the sun was up it was truly a wonderful start to the day. That marvellous clean fresh air, the warm winter sun, a visibility for miles and to top it all, a good breeze for Maria high above. She so enjoys her freedom, that I wished I could get up here more often. I was enjoying myself looking at the extent of the badger setts on the open hill side, and marvelling at how difficult they were to see until you were right on top of them. I was not really paying full attention to Maria who had been cruising back and forth along the line of the hill top about sixty feet or so high. When I did look up I was just in time to see her go into a long shallow stoop. 'Oh dear,'or words to that effect, what the heck had she seen. I strained my eyes along the angle she was diving in, I could see nothing. she pulled her wings into her body and the dive became more intense and the speed increased. She was really pulling out the stops on this one, and then she passed over a hazel thicket on the hillside I saw what she was after. In the split seconds before impact I saw a roe deer standing on an out jut so well camouflaged from where I stood. It had sensed danger, but not from where it came. She hit it in the head so hard that it was lifted off all four feet, and did a complete somersault down the hill with the eagle binding to it. It took me about ten minutes to reach her. She was alright and had the deer well and truly trussed up, I could not see the deer's head as it was under its body. Maria had one of her legs between the back legs of the deer and had hold of the head, the other foot had the deer by the neck. I could not get to the head or neck of the deer to dispatch it, and so lifted the eagle off, fully expecting the deer to explode into life and give us both a good kicking. To my surprise the deer was stone dead, the impact and fall had broken its neck. I left the deer where it lay and carried the eagle back to the vehicle. I then made my way back to where the deer lay, threw it over my shoulders and staggered over the hill back to the car. After I had informed the landowner of our deed and he had kindly donated the carcass to me, I went home and weighed the deer, it came to fifty two pounds. Not bad for a bird at a flying weight of eleven pounds I thought, but then in reality its about as good as a gos with a large brown hare. For the next few weeks I kept away from that side of the hill as I did not want it to become too much of a habit, there were not enough deer on this estate to go after them on purpose. Some time later in the season we did stray back into that area, but it was later in the morning, and I remember telling myself that any deer would have cleared from the area by now. She had landed just below the top of the hill and I was in the valley bottom, I had decided to call her down and I was waving a juicy titbit and calling to her. She did not respond straightaway, it took a few minutes to attract her attention. She lifted off and started coming straight towards me, I usually wait as she fly's out from the hill then dives straight at me, I leave it to the last seconds and throw the titbit as high as I can, she pulls out of the dive and catches the reward and lands to eat it. She was just at the point where she was about to pull in her wings and start the dive, when she turned at a right angle to her line of flight and along the hill in a long dive, ending with an almighty crash through the tree tops and into the undergrowth. Almost at once the valley was aloud with devilish screams and growls. As usual I made my way to where I thought she had landed in my stylish manner, at full tilt, tripping over undergrowth and sometimes on all fours, I reached where she was, standing proud with one foot firmly grasping a foxes head, the other the hind quarters. …That was, and is, how Maria and I enjoy the winter months and now with the hunting season over, here I am sitting on a perch, daydreaming of her flying high. Alongside me, a huge nest constructed of load after load of dry sticks, heather and wood rush. She fly's back on to the perch on which I sit, to relieve me of my duty of minding her eggs, while she has a break from the long and boring job of incubation. As she so carefully steps into the centre of the nest and with her beak pushes the eggs into position, fluffs up her breast feathers and settles, I leave her in peace and look forward to next season when she is once again winging her way through the sky.